With it’s classic red-brown brick exterior trimmed with limestone, reminiscent of a classic fieldhouse, Lucas Oil Stadium breaks away from the current mold of NFL stadiums. It replaced one of the smallest stadiums in the NFL when it opened in 2008, the RCA Dome. Not only did RCA Dome have one of the smallest seating capacity in football, it lacked luxury and club seats and had a dome. The Colts wanted a new modern stadium built in downtown Indianapolis that featured the same amenities found in new NFL stadiums. In December 2004, the Colts and the City of Indianapolis agreed to construct a new $720 million stadium for the team. The Colts contributed $100 million toward construction with the remaining amount coming from the State of Indiana and the City of Indianapolis through increased taxes on food and beverages. On September 20, 2005 construction began on the stadium, adjacent to the RCA Dome. In March 2006, Lucas Oil Products bought the naming rights to the stadium for $120 million over 20 years. Erik Dickerson rushes for 1,311 yards in 1989. QB Peyton Manning passes 49 touchdowns and wins NFL MVP in 2004. The Colts played their first regular season game at Lucas Oil Stadium on September 7, 2008 against the Chicago Bears. 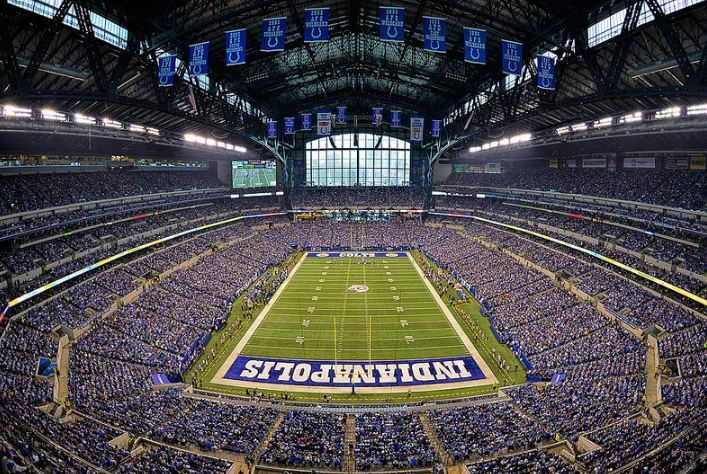 Located in downtown Indianapolis, the stadium features a retractable roof that allows the Colts to play outside for the first time since the team moved to Indianapolis from Baltimore. The two panel roof opens or closes in 9 to 11 minutes. On the outside, the stadium has a facade of brick and glass allowing it to blend with surrounding buildings. It features moveable glass windows on the north side of the stadium, that consist of six panels, each 88′ tall by 213′ wide. Inside, Lucas Oil Stadium has seating for 63,000 fans that is expandable to seat 70,000 for larger events. The Fieldturf playing field is 25 feet below street level allowing fans easy access to their seats. Many modern amenities are found throughout the stadium from the high definition replay/scoreboards to the 139 luxury suites. Lucas Oil Stadium has one of the largest videoboards in the NFL. Consisting of three screens each, the 97-foot-wide-by-nearly-53-foot-high scoreboards hang in the northwest and southeast corners of the building. Aside from serving as the home of the Colts, the stadium hosted the NCAA Basketball Final Four in 2010 and 2015, and serves as the permanent back up host for the Final Four Tournament. Lucas Oil Stadium was the site of Super Bowl XLVI on February 5, 2012 as the New York Giants beat the New England Patriots.